If you've been here for long, then you know that every year around this time, I join Courtney Joseph over at Women Living Well for her annual Making Your Home a Haven challenge. I'm excited to announce that it's time again for the making your home a haven challenge! This week for Week 1 we are to light an extra large candle in our home every day. Like Courtney, I have placed my candle in my kitchen. It's on my kitchen table as you see in the picture above. I got a great deal on my candle with a coupon from Yankee Candle for a buy one get one free! I gave the other extra large candle to my daughter who is doing the Making Your Home a Haven challenge with me this year. I'm so excited that we are doing this together! I hope you'll join me too! This week we are praying to live out the fruit of the Spirit of peace and patience in our homes. Each time the light of the candle catches your eye, say a prayer for peace and patience in your home. Many times, at least for me, my peace is threatened when my patience is running thin. Do you ever have those kind of days? I have to admit that most of the time it is because I have put too much on my "to do" list. God is really dealing with my heart on this issue lately. Sometimes we can be doing so much that we lose the joy in the midst of the doing. I'm learning that we need margins in our lives - and marked boundaries - and that it's okay to say no in order to experience peace and patience in my home. So as I sit here typing this blog post, I can glance over at my kitchen table and see the burning flame of my candle and in my heart I say a prayer for peace and patience. Heavenly Father, thank You for the reminder that in order to have peace and patience in my home it begins in me. Help me to remember that I am the key ingredient to making my home a haven for my family. Give me wisdom in how to use my time wisely so that I'm not impatient with those I love. If there are things in my life that I need to let go of - even if they're good things - help me to do that in order to create margins in my life so that peace and patience can be a natural fruit of the Spirit flowing from my life and into my home. I humbly ask these things in the gracious name of Jesus. Amen! 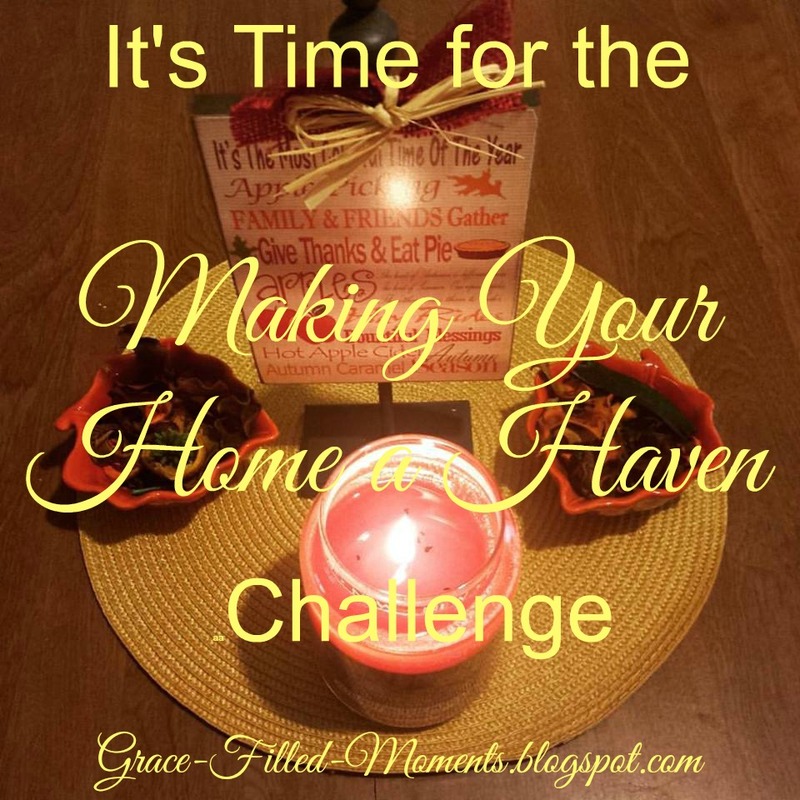 Join me here again next Wednesday for Week 2 of Making Your Home a Haven! May you and your family experience the peace and patience of the Holy Spirit in your home this week!